It’s important for long-term health, especially for children, to eat a balanced and healthy diet. 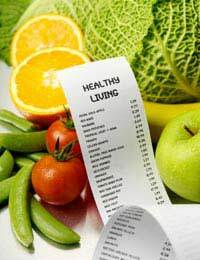 This can seem a lot harder on a low income, but it is possible with careful shopping and cooking. Many supermarkets have low-cost brands, but look out – sometimes these are cheaper because they are poor quality or higher in sugar or fat. Buy wholegrain pasta, rice and cereals where possible – buying in larger packs can save money, and these will keep well if resealed and kept in a cool dark place. Avoid buying poor quality, high-sugar and high-fat foods, such as biscuits, as a basic – they may seem cheap and filling, but are not very healthy for adults or children. Some areas have co-op schemes, where a group can buy fruit, vegetables or other foods in bulk, reducing the costs, and some local councils and charities have schemes for low-cost or free fruit and vegetables for low-income people, especially those with children. Keep an eye on the reduced section in the supermarket – while these foods need to be eaten quickly, they will be cheaper and can add variety (and sometimes a bit of luxury) into a low-income diet. Get to know the times and days that the food tends to be reduced. Markets are a low-cost way to buy fresh fruit and vegetables, meat and cheese, and some car boot sales also have market gardeners selling off some extra produce. Go to markets towards the end of the day for the best bargains, and put any extra in the freezer for later in the week, month or year. Frozen, tinned and dried vegetables may be cheaper than the fresh versions, keep for longer and are still as full of vitamins and minerals, and still count towards the ‘five a day’. Some people are concerned about trying new foods, because they can’t afford to waste anything – try adding in new flavours stealthily, perhaps in a home-made soup or pasta sauce. Rather than getting large quantities of cheap, low quality food, it’s better to buy small quantities of good quality food and make it go further. For example, instead of buying cheap, high fat mince, get a smaller amount of good quality lean mince and make it go further by adding dried soya mince, red lentils, tinned baked beans, or frozen vegetables and tinned tomatoes. Most families have leftovers, and there are lots of ways to use them – make a curry out of leftover chicken, mince (or chop finely) cold beef for a pasta sauce, with tinned chopped tomatoes and a few herbs, or mix tinned tuna with leftover mashed potatoes to make fish cakes. Vegetables don’t get much cheaper or more local than home grown. If there is a bit of land available, however small, it’s worth a try. Friends or neighbours (or recycling sites such as Freecycle) can be a good way of getting hold of spare seeds and gardening essentials – so all growing-your-own will cost is a bit of time and energy.